Hoya is a genus of tropical plants in the Asclepiad family. When one thinks of hoyas one usually thinks of the old favourite, Hoya carnosa, which is better known as "Grandma's Old Fashioned Wax Plant", and lets it go at that, assuming that is all there is to it. When curiosity gets the better of a novice grower, to the point that he or she orders an advertised catalogue, just to learn why anyone would have the nerve to advertise a catalogue with only one plant in it, shock often results from learning that Hoya is a genus comprised of around 200 different species, plus numerous cultivars. Hoya was once part of the Apocinaceae family of plants. Robert Brown created Asclepiadaceae in 1810 to accommodate a group of Apocinaceae plants whose characteristics did not fit well into that family. He named the new family Asclepiadaceae and included in it all those former Apocinaceae plants having their pollen contained in gelatinous masses called pollinia (singular is pollinium). The only other group of plants with pollinia are the Orchids. Asclepiadaceae includes the common roadside milkweeds (Asclepias), the popular succulent Stapeliads, which look more like cacti than Asclepiads and the very interesting Dischidias, whose leaves are often shaped like pouches and urns and serve as homes for ants. Hoya contains the most beautiful flowers in the family. Robert Brown was born in Scotland on December 21, 1773. He studied medicine in Edinburgh but did not take a medical degree, preferring instead to study the plants that, at that time, all medical specialists depended upon as cures. Despite his lifelong dedication to the study of plants, he is best known today in the scientific community for the discovery of "Brownian Movement," which, simplified, is "the motion that you see in a liquid containing minute suspended solid particles." It is only by chance that hoyas are known today by the name Hoya. There is still some controversy over which name, Hoya R.Br. or Sperlingia Vahl came first. Both names received their first publication in 1810 at about the same time. Some say that Brown's publication preceded Vahl's by several days and others argue the other way. The sides are so divided that there is a movement afoot to instigate formal efforts to have the name Hoya conserved since it is the most widely known name. If Vahl's manuscript had been published when it was first submitted there is no doubt that Hoyas would be known as Sperlingias today. Sperlingia lost out due to its author's having been hanged for treason. His manuscript was not published until long after his death, it is said, because no publisher was willing to have his name associated with that of a traitor. Robert Brown named Hoya in honour of his friend and fellow botanist, Thomas Hoy, who was employed as head gardener by the Duke of Northumberland at his estate, Sion House. There is no record of Thomas Hoy's ever having grown a Hoya but surely he must have, since his employer was an avid collector of rare tropical plants. We usually think of Hoya as succulent and there are, indeed, a lot of succulent hoyas, plus many more that have succulent parts, but the vast majority of them are non-succulent. We also usually think of Hoyas as vines but there are many species with little to no vining tendencies. For plant collectors, there are hoyas for every taste and situation. Some are twining vines; some are woody shrubs; some are entirely terrestrial; and some are epiphytes. There are still others that begin life as terrestrials then lose all contact with the ground and continue life as epiphytes. Many cling to their supports both by twining and by adventitious roots, but others grow as upright shrubs. There are a few that begin as upright shrubs but after becoming several feet tall, continue their life as twining vines. Some hoyas are woody; others are soft and succulent. Some have woody stalks and succulent leaves. Others are thin and wiry with papery leaves. Hoya leaves vary in size, texture, colour and venation. In size they range from a centimetre in length and from two to four millimetres in width (Hoya engleriana, Hosseus) to 25 cm. by 25 cm. (Hoya latifolia, G. Don). Hoya coriacea, Blume, is said to sometimes have leaves as long as two feet in length. One of the most succulent of the lot, Hoya kerrii, Craib, has perfect valentine shaped leaves, with the notches at the apexes of the leaves instead of at the bases. This species has two forms, one with glabrous leaves and one with suede textured leaves. There are hoyas with almost perfectly round leaves and others with linear leaves (Hoya linearis, Wall. ex. D. Don and Hoya teretifolia, Griff. ex Hook. f.). A popular species, Hoya shepherdii, Short ex Hook. has leaves that look for the world like bunches of string beans hanging from their stalks. Hoya linearis, Wall. ex D. Don is covered with fine downy hair and greatly resembles masses of Spanish Moss (Tillandsia useneoides) hanging from trees in its native habitat. Some Hoya leaves are smooth and shiny; some are covered with hairs. Some Hoya leaves appear to be veinless while others have very conspicuous veins of a lighter or darker colour than the rest of the leaves. Some have leaves that are mottled with speckles of silvery white (Hoya carnosa, R. Br.). Some Hoya leaves are smooth and shiny and others are covered with hairs. 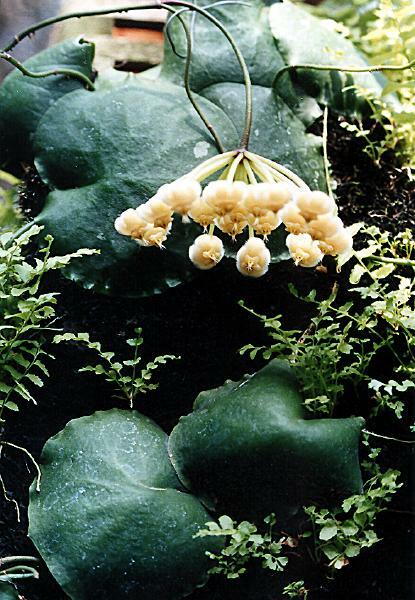 Some hoyas have leaves that are thin and translucent (Hoya coriacea, Blume); some are so thick and succulent that they look more like crassulas than hoyas (Hoya australis subsp. rupicola, oramicola and saniae from Austrailia and Hoya pachyclada from Thailand). Hoya flowers are just as varied as the leaves, despite the fact that all are shaped like five pointed stars. They grow in umbels, usually with many flowers per umbel. Individual flowers range in size from as small as four to five millimetres in diameter (Hoya bilobata, Schltr.) to well over three inches in diameter (Hoya imperialis, Lindl. and H. macgillivrayi, F. M. Bailey). The number of flowers per umbel varies from one (H. pauciflora, Wight.) to 55 or even more. Hoya coriacea, Blume has been known to have as many as 70, each measuring nearly 2 centimetres in diameter. The single flowered Hoya pauciflora, Wight makes up for its paucity by its flower size of nearly an inch and a half in diameter. Just as hoyas vary in size, they also vary in texture, some being glabrous and shiny and some being quite hairy. They also vary in colour. They come in the purest white, varying shades of pink from almost white to rubber-doll or bubble-gum pink, yellowish-pink, yellow, green, purple, brownish-red and brown. There are some that are so dark that they are often referred to as black. Until recently it was thought that a true red hoya was not ever likely to appear but recent discoveries make that seem possible. One of the two clones of Hoya mindorensis, Schltr., from the Philippines, which are currently in circulation, comes very close to being a true red. Blue still does not appear to be represented in the Hoya genus. Hoyas are, for the most part, very easy to grow. They require a well drained soil, warmth and lots of humidity. Many people will tell you that the temperature must never be allowed to fall below 60 degrees F. or go over 85 degrees F. I have seen no harm resulting from night temperatures of 45 degrees F. in winter or 120 degrees F. in daytime temperature in summer. Here in north central Georgia, several of us have had Hoya shepherdii, Short ex Hook. survive outdoors all winter, when we forgot to bring it inside. All of us reported that our plants were left in well sheltered areas but, even so, we often have winter temperatures below 20 degrees F. Hoya shepherdii is native to the lower Himalayas, where freezing does occur so that explains its hardiness. As for temperatures at the other end of the thermometer, we must remember that most hoyas are native to the very hottest spots on earth. The secret to survival under less than ideal conditions appears to be providing lots of humidity - very near, but not quite, 100%. When it is cool, water should only be applied in amounts to prevent leaves from shrivelling. One Atlanta grower lost most of his hoyas last winter because the roots got too dry. My Hoya roots were given even less water than his and mine thrived. We compared notes and concluded that the only difference between our growing conditions was that the humidity in my greenhouse was near the saturation level. Humidity provides summer protection too. I have seen Hoya leaves burn nearly to a crisp in summer, even with exhaust fans running full time and daily watering - and with a 50% shade cloth covering the roof. I do not use exhaust fans in my greenhouse because I find that mealie bugs are sucked in with the breeze. I have lots of circulating fans inside and maintain humidity near the saturation point. There's rarely a burned leaf. Although many Hoyas will grow well and make lots of beautiful leaves in a centrally heated-air conditioned living room, it is very rare that one will bloom in one. If a living room is the only indoor place you have for growing hoyas, if you want them to bloom, find a place outdoors in summer - under a tree or, better yet, on a screened porch - anywhere that protects them from noonday sun. Many Hoyas respond to a bit of lime in the potting mix but most of them do better in a very slightly acid compost. Some, being coastal dwellers can even take a bit of salt spray so if you live near the ocean in a warn climate, you should have no trouble finding a hoya suitable to your conditions. One, Hoya halophila, Schltr., whose name means "salt lover," was originally discovered growing on the beaches of New Guinea and nearby smaller islands. There are many other coastal hoyas and many that are found growing, suspended above bayou waters from the branches of Mangrove trees. There are also a large number that are native to mountainous areas, some in calcareous soils and some in soils containing granite and shale. Others live symbiotically with ants. In some species, such as Hoya imbricata, Callery ex Decne., one of the leaves at each node (which are paired in most Hoya species) aborts and the single peltate leaf that remains, flattens itself against the trunk of its host tree and clings there, being held by numerous nodal roots. Ants build their nests beneath the leaves and contribute to the plant's nourishment. Another species (Hoya darwinii, Loher) provides a home for ants in a different way. For much of its life, its leaves look like normal leaves, but something will trigger the growth mechanism and cause the lateral margins of some of its leaves to stop growing, while the centres continue to grow. The result is leaves that are rolled up into ball shapes, looking much like green golf balls. It isn't known what causes this but it has been suggested that it is caused by the presence of formic acid, a by-product of ants. The sheltered golf-ball leaves serve as homes for ants, whose wastes fertilise the host plant and the unsheltered leaves collect rain water which is utilised by the host plants during dry periods. Another ant lover is the popular miniature, Hoya lacunosa, Blume. Although usually grown as a pendulous hanging basket plant in cultivation, in its habitat it is a tree climber. It is usually found growing out of the ground from the center of an ant bed. As it climbs up the trunks of nearby trees, the ants build "dirt-dauber-like" tunnels along its stalks, in order to give their tunnels stability. The ants live inside the tunnels and supply nourishment to the plants. Collectors, in the wild, often find, to their sorrow, that a plant with not a single ant in sight will suddenly come alive with vicious ants, when they cut a stem and try to dislodge a cutting. The species of ants that occupy those tunnels are said to sting like the dickens and leave painful, itchy sores with days worth of scratching in their wake. Not to fear, this lovely and very fragrant wee hoya will grow very nicely without ants so don't fear growing it. The most difficult aspect of growing hoyas is finding correctly labelled ones. Many people don't care a bit what their hoyas are called - or even, if they have names. They grow by God and by guess or pure animal instinct and never lose a plant. Others like to learn about their plants' native habitats and try to match climatic and soil conditions to those habitats. That is next to impossible for Hoya growers because dealers call plants by whatever names suit them. It does one little good to know that Hoya griffithii, Hook.f., for example, is a native to northern India, Sikkim and Nepal, if the plant one buys with that label actually came for an island in the southern part of the Solomons, which is exactly where the one I got so labelled originated. One grower (no longer in business) once listed over 200 different species names. I bought every single one of them and learned, to my sorrow, that the dealer had only 7 different correctly identified species and one of those was labeled only half right. All the rest were either duplicates of those seven with different labels or cultivars of them, plus a number of unidentified numbered species. Hoyas are liked by three common garden pests, aphids, mealy bugs, red spider mites and scales. These are easily controlled by systemic insecticides, unless you are opposed to their use. Many control them with plain old rubbing alcohol. Many spray it on the plants right from the bottle. Others dilute it with water and add soap or sticker spreaders to it. Some say you should wash the alcohol off after it has done its job, but it isn't necessary. It does no harm as long as the sun doesn't hit the plants while they are still wet - it is no different than plain water in that respect. Some use insecticidal soaps. I have found the use of alcohol and insecticidal soaps to be worthless, except that alcohol applied to a swab, used to wipe the insects off does a pretty good job but this is extremely impractical in a large collection and could become a full time job. Others use preying insects. We in Atlanta learned the hard way a few years ago that preying insects, which are not native to the area can create more problems than they solve. Once they feed on the mealy bugs, they start looking for other food and that food may not be what you'd like them to feed on. Also when removed from their natural homes they must find other nesting places to their liking. Ten million non-native Lady Beetles crawling all over one's ceilings, floors, furniture and inhabiting one's bread box will cure one of importing exotic preying insects very quickly. If one has only a few plants, swabbing with alcohol is the ideal method of ridding ones plants of insect pests. In a greenhouse with several thousand plants, chemical control is the only practical solution. If you can afford to hire professional handlers to apply the chemicals, I strongly advise it. If you do it yourself, be sure that you follow the directions on the container precisely and wear protective clothing. The best method of pest control is still to avoid them in the first place. Keeping all new plants isolated for about six weeks before introducing them into your pest free collection is the best advise you will ever follow.